Harold Herrington is a maker of anglo concertinas based in Mesquite, Texas. He has been making anglos for some years now, of two basic designs: square and hexagonal. In order to reduce costs he uses accordion reeds made for him in Italy, but they are fitted into a true reed-pan (based on the Jeffries reed-pan), which helps give the instrument a much better tone than is usual with concertinas based on accordion reeds. His main seller is the C/G anglo, intended for Irish music and thus designed to be both fast and light. The hexagonal models look more like conventional concertinas, but the square ones are very much their own instruments. My G/D concertina arrived a few days before Sidmouth festival, so I took it with me to the Radway for the music sessions there. Not surprisingly I got quite a bit of interest and comment - my two favourites were "What's that? Some sort of minimalist melodeon?" and "There's the man with the square concertina - you weren't making it up!". I found that it played very well. It is a very light and positive instrument with a fine action and plenty of volume. 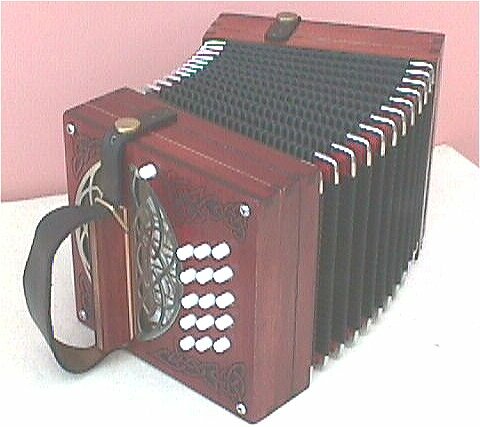 The tone of course is different from a true concertina, but is pleasant nonetheless, and fits very well into the sound of an English music session with its numerous melodeons. The look of the instrument was also fine too, very much fitting into its surroundings. Herrington's concertinas are priced $1200 for the square models and $1500 for the hexagonal. Personally I think the square ones are so nice there is little point in forking out the extra $300. I have always felt that a good beginners instrument is one that will continue to suit the player until long after the appellation "beginner" is no longer appropriate. This Harold Herrington's concertinas will do very well, and I believe they deserve to succeed.